MAC ZANADU is an attractive profiling bull who spreads out a light birth weight with above average weaning performance. 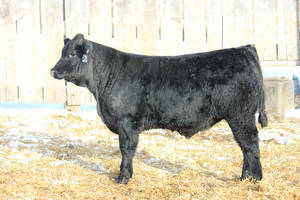 His sire, XERXES, was the top selling bull of our 2011 sale to Erbele Ranch of Streeter, ND. His dam has consistently produced moderate birthweight with above average performance. She has an average weaning ratio of 102 on 4 calves with an average birth weight of 81. He is also quad-polled and smooth polled.